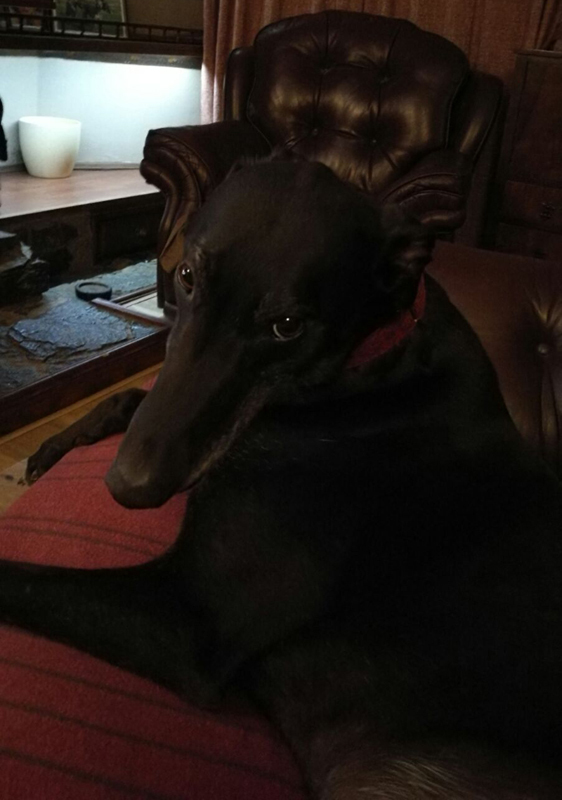 Rocky is a super black ex-racing Greyhound who was born in May 2011, weights 34.7 kg. and has, since arriving here discovered the settee, loves cuddling up to you while you are on it and has, turned into a true couch potato! Rocky is neutered, house trained, inoculated and microchipped. Having a nice friendly nature he loves being around people and travels well in a car. He walks nicely on a lead and while out walking he shows no interest in other breeds of dogs who may be out and about. He's a really lovely dog who will make someone a super companion. We heard today that Rocky has settled down very well, has discovered the doggy larder and loves the garden. His cheeky character shines through, and he and his new owner's Cocker Spaniel are the best of friends, often curlling up together. They say he still loves to wrap himself around them in the evening wanting lots of hugs and cuddles.